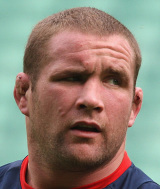 For more than a decade Phil Vickery was regarded as England's premier tight head prop, a reputation which reached its zenith when he was appointed the national team's captain by Brian Ashton in January 2007. With England still struggling somewhat to come to terms with the 2003 World Cup win the appointment might have been seen as a tough assignment. But Vickery grabbed the opportunity and led the team to the 2007 World Cup final in Paris, beating Australia and France along the way. Vickery made his international debut against Wales in 1998, just 34 matches into his first-class rugby career and a mere 81 days after his bow at England 'A' level. He played in the 1999 World Cup and in 2001 received the ultimate accolade for a British or Irish rugby player - a call-up for the Lions' trip to Australia, a tour in which he played in all three Tests. His captaincy potential was also being recognised around this time and Vickery led a relatively inexperienced England team to victory over Argentina in Buenos Aires in 2002. Just over a year later and he was one of the rocks of England's World Cup triumph, playing in every game and scoring his first international try. The proud Cornishman was by now a Gloucester legend, but repeated injuries meant that his tally of caps was not necessarily rising as quickly as possible. Neck, shoulder, back and arm problems have taken their turn to rule Vickery out of the game at one point or another, but he has continued to come back again and again. In 2006 the unthinkable happened as Vickery was deemed surplus to requirements at Kingsholm and he moved to London Wasps. In terms of domestic silverware however the move has been a success. Wasps won the Heineken Cup in Vickery's first season at Adams Park and the Guinness Premiership in 2008. He was selected for the 2009 Lions tour of South Africa and started the first Test in Durban but was destroyed in the scrum by Tendai 'Beast' Mtawarira. He was dropped for the second Test but after injuries to Gethin Jenkins and Adam Jones the 'Raging Bull' was recalled for the Johannesburg Test. The veteran underwent an operation on his neck in November of that year, forcing him out of England's autumn internationals and his subsequent recovery also sidelined him for the 2010 Six Nations. He wanted to play in one last World Cup but time eventually caught up on the prop as he retired from rugby due to medical advice on October 28, 2010. In December 2011 he was confirmed as a coaching consultant for National One side Cinderford.